The list shows slots where patterns are kept. 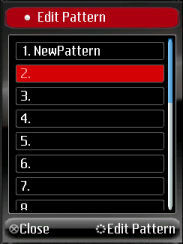 For a new pattern, and empty slot is highlighted, to change an existing pattern, the pattern to change is highlighted. 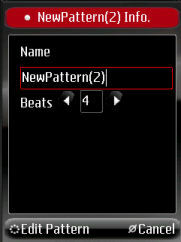 When a new (blank name) pattern is selected, the pattern information screen is displayed, with a default pattern name. The name can be changed to something more meaningful. It is not possible to give the same name to many patterns, pattern names must be unique in the project. 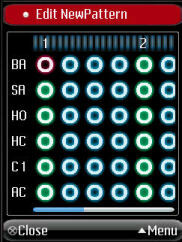 The number of beats in the pattern can also be set here. It is usual for a pattern to have 4 or 6 beats. The minimum allowed is 1. It is worth noting that one beat is made up of 4 steps. Selecting cancel, cancels the operation, and the pattern options page is displayed. 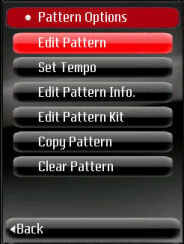 Selecting Edit Pattern opens the Pattern editor for the pattern being edited. The steps are set to on (filled circle) or off by tapping on it or using the fire button. The current step is displayed in red. The last instrument (AC / Accent) is present on every pattern. When an accent step is set to on, the sounds are played at a louder volume, thus allowing a step to be emphasized. Accents are discussed in the Settings Options --> Accent Volume page. 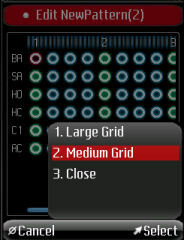 The menu has options to select the grid size: small, medium or large. Only the sizes not currently displayed are present the menu. Large Grid displays a large grid, medium a medium grid. The current size is small. Selecting Close exits the pattern editor. By default, the pattern editor can be heard. The step number indicator is animated to show the current step. On some phone models, the animation can lag behind the step being played.